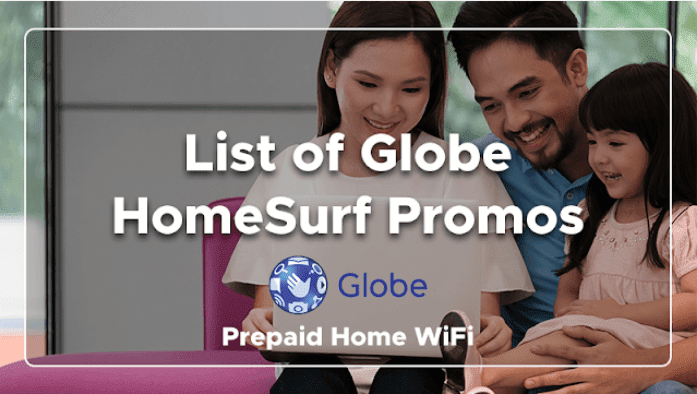 Globe HomeSurf Promos are consumable data promos exclusive to Globe Prepaid Home WiFi subscribers, that gives bulk gigabytes of mobile data consumable per kilobyte. Enjoy surfing the web, Facebook, Twitter, Instagram, listening to music, streaming videos on YouTube and playing Mobile Legends, AoV, ROS together with your friends or family. Home Prepaid WiFi promos can be availed in 3 denominations that starts with P15, P349 and P599. Just go to the nearest Globe load retailer to reload your Globe Prepaid Home WiFi account. You can register Globe HomeSurf Promos in 5 ways: (1) Globe at Home App, (2) dial *143#, (3) Globe Share-A-Promo, (4) AutoLoadMax, and (5) GCash. Below is list of Globe HomeSurf Promos and how to register them. Requires 15 PHP load and must be registered first to GOSURF50. You can register HomeSURF15 as many times as you want as long as GoSURF promo has not yet expired. *Enjoy FREE INTERNET for videos and games when you register to any HomeSurf variants. You can have unlimited access to Viu, League of Legends and Arena of Valor. Binge-watch K-dramas, and play LoL and AoV all day, only at Globe Home Prepaid WiFi. You can choose any of the 5 ways to register Globe HomeSurf Promo. Download Globe At Home App first and link your modem mobile number. 4. Select the promo you desired on the list then click Subscribe. Using Globe At Home App, you can easily load, track, and manage your Home Prepaid WiFi. *143# is Globe USSD Code menu to access promos and other services. 11. Done! Wait for successful confirmation message before browsing. Globe Share-A-Promo service lets Globe subscribers transfer promos like Globe Home Surf Promos to Prepaid Home WiFi SIM. 2. Reply YES to the automated response text to proceed with the share-a-promo transaction. 3. Wait for the SMS confirmation and enjoy surfing at home! Promos include: GOSURF50, HOMESURF15, HOMESURF349, and HOMESURF599. A P1.00 transaction fee will be charged together with the price of your preferred Promo. AutoLoadMax is an electronic load (e-load) that lets you buy prepaid load credits or HomeSurf Promos for your prepaid account. 5. Wait for the successful confirmation message and start surfing the internet! Download GCash app first and register. 8. Done! Enjoy surfing at home together with your family or friends! To check your remaining data allocation as well as your prepaid balance, just go to the Globe at Home App Dashboard. You can also go to the built-in SMS by opening your browser and go to 192.168.1.1 then navigate SMS, and text HOMESURF STATUS to 8080. All HomeSurf Promos are stackable, meaning you can register to a HomeSurf Promo while you're registered for another. Data allocations will be added together and the validity of the promo with the longest validity will apply. If you already used up all your MB allocation, your succeeding internet connections will be charged the regular browsing rate (P5 for 15 minutes or P2/MB) unless you register again to a HomeSurf promo or any Globe mobile data promo.